5.75 points at 8 votes (rank 682). 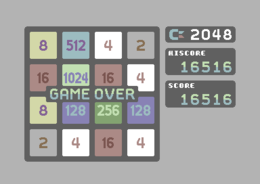 "C-2048" is the C64 conversion of a popular game for mobile phones. On a field the size of 4x4 tiles two stones with the same value - which is the power of two - need to be brought together, so they merge and form a new stone with the sum of the two stones. E.g two stones with the value "2" merge into a stone with the value "4". After each move a new stone appears on the field with either the value "2" or "4", so that it soon gets cramped on the field and therefore space needs to be made. When the field is full and no stone can be moved any more, the game is over. 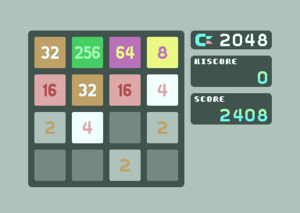 The player's score rises by the value of the merged stones. The programme was an entry by P1X3L-Net for the 16k Compo 2014 by RGCD and ranked 7th. The game is graphically smooth. The colours were chosen well. There is no danger in mixing anything up. It also plays nice and fluently, so you do not fight against the controls, but in a nice flow. The in-game music by Taxim fits the game very well and is very catchy without being unnerving after a few minutes. When a direction has been given, all stones on the field move into the corresponding direction until they are stoppped by another stone or the borders of the field. If two stones of the same value meet, they merge to a stone with the sum of the single values. Always try to group the stones with the high values in a certain corner, so e.g. the highest values at the upper left and the lowest at the lower right. This raises the chance to have stones with the same value together. An Easter Egg: If you press 4,6,9,0 at the same time during the loading screen of the cartridge version, the game will start as "C-4096". This does not work with the disk version. Rockford: "The smartphone game had grabbed me for a short time, therefore I was happy to be able to play 2048 also on the C64. In contrast to other conversion for the C64, I found this really no trouble to play and it does not jitter. Always good for a game in between. I give a 7. The conversion is top, but it will always stay "only" a brain teaser." TheRyk: "Initially I was a little sceptical as I am no fan of smartphone casual games at all, but having tried it, I was finally not the only one praising this game for being one of the best games of RGCD 2014, especially with regard to music. Great brain teaser game, 8 points." GenerationCBM: "Great conversion of the slightly hooking original concept by Gabriele Cirulli. Cross-platform definitely one of the better versions, because sufficiently fast and fluent and by this significantly better to play than many another jittery port. 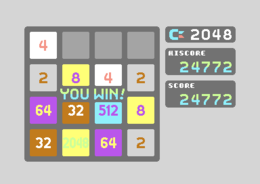 It has only one small flaw in comparison with the original: C-2048 is decided as "won" when you reach the 2048 stone and ends the game, no ifs and buts, while the original game (and practically all ports) go on if needed until there is no space left any more (which means, two 2048s give together one 4096 stone, two 4096s give one 8192er, etc.). 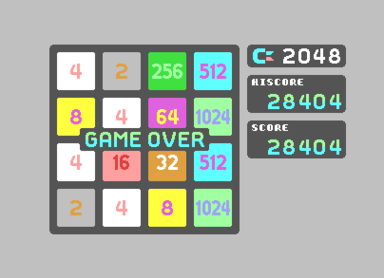 This has relatively considerate effects on the highscore, because when having the 2048 stone, you "always" have slightly over 20.000 points anyways. If you want more you need to artificially prolong the game and make subideal mistakes into your round and this is already quite absurd. Furthermore, it is (at the moment) not completely free of bugs, e.g. the game sometimes reacts into the total opposite direction of your input. However, altogether a nice thing that I like to play." The probability for a "4" as a new stone is approx. 10% for a "2" it is 90%. 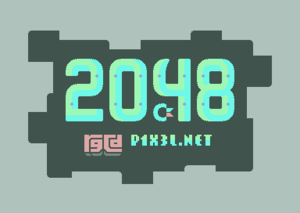 If you unzip the cartridge image "C-2048.crt" with a ZIP compatible packer, you will find additonal files. No official cover was released for this game. This page was last modified on 10 July 2017, at 18:48.